This album was added to our database on August 4, 2002, and the album's information was last updated 8 years ago. efesar is responsible for keeping this album's information up to date. This page has been viewed 8150 time(s). 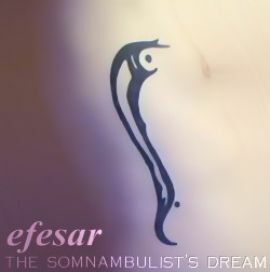 Play all the songs on "the somnambulists dream"
efesar expands into the realm of hypnotic and abstract while still maintaining the recognizable style that defines his music. i'm trying to give a detailed review for each song about how the music made me feal and what in the music made me feal that way but i'm running into some dificulties due to lack of terms(my vocabulary) that i dont know to help me explain to you these details but i'll eventually finish them. Your music is amazing and saddens me because i did not know about it sooner. © copyright 1993-2007 by fearstudios.com ( 186313039+158ms ). All Rights Reserved. Report a bug or make a suggestion.